This 4-CD Set brings together the integral trio work of one of the best and more under-rated bebop pianists, including most of his original compositions. "Pianist and composer Elmo Hope's music might best be compared with that of Herbie Nichols. Both men shared some of Bud Powell's intensity, Thelonious Monk's inventive whimsy and, at times, hints of young Cecil Taylor's realistic approach to the impossible. Over the years, both Nichols and Hope have achieved posthumous respect from an international jazz community which is itself marginalized. While Herbie Nichols could be said to have been ignored to death, Elmo Hope's life and work were grievously complicated and ultimately extinguished (in 1967 at the age of 44) by the same narcotic plague that afflicted so many of his contemporaries. 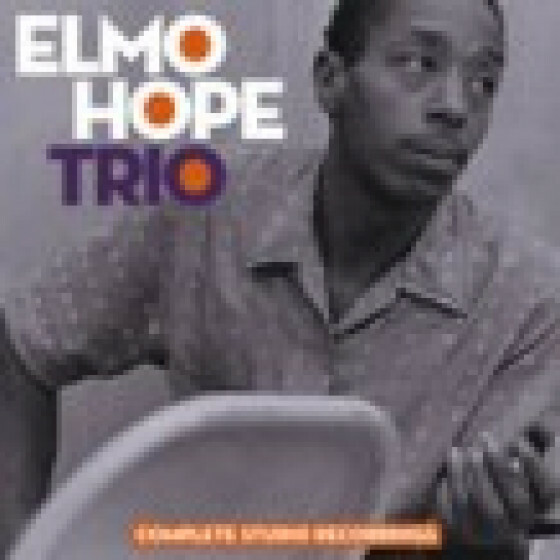 Because Hope's music has never been adequately recognized or appreciated, the 2007 release of Gambit's anthologized Complete Studio Recordings of the Elmo Hope Trio (1953-1966) is a glorious and unprecedented achievement. Born in 1923, St. Elmo Sylvester Hope was the son of West Indian immigrants who settled in New York. He grew up with Bud Powell, studying J.S. Bach and dreaming of new concepts in modern music. Hope's first recordings were with trumpeter Joe Morris, whose little R&B band boasted such innovative young minds as Johnny Griffin, Percy Heath and Philly Joe Jones. When in 1953 Alfred Lion gave Hope his first opportunity to record as a leader, he chose Heath and Jones to catalyze the eight tracks issued on New Faces, New Sounds. Other albums reissued here entirely or in part are Meditations, Elmo Hope Trio, Homecoming!, Sounds from Rikers Island (later reissued as Hope from Rikers Island); Here's Hope, High Hope and The Final Sessions. As his career progressed, Hope was able to record with a series of excellent bassists: John Ore, famous for his work with Monk; Jimmy Bond, a sideman for Chet Baker and Ella Fitzgerald; the mighty Curtis Counce; Sun Ra's Ronnie Boykins, Blue Note sessionman Butch Warren and Coltrane's close collaborator Paul Chambers. While various skillful drummers pop up throughout this compilation (Willie Jones, Frank Butler, Clifford Jarvis and Granville T. Hogan), Philly Joe Jones was Elmo Hope's preferred percussionist from his first trio recording date through to the very last. Even as some of his music rippled with the restless energy of Herbie Nichols, Hope also made a point of composing and performing ritualistic reveries of profound and breathtaking slowness, sometimes drifting into a trance-like space where the listener may follow in order to contemplate the mysteries of life and death, of creativity and collective improvisation. Like Herbie Nichols, Elmo Hope imprinted everything he wrote and played with an indelibly personalized, harmonically advanced language. This is an unprecedented opportunity to learn that language intimately, as never before has anyone bothered to compile this much Hope in one comprehensive edition." "Elmo Hope was born in New York City in 1923 and died there May 19, 1967. During his 44 years he lived the dark, confusing life which, in retrospect, seems to have been the fate of too many musicians in the time of Charlie Parker. Some survived the period. Others, like Elmo Hope, were destroyed by it. But Hope's art remains-preserved for us on a few recordings. Hope's place in the evolution of modern jazz piano (by which I mean the transition from swing style to the bop that dominated the mid-1940s) has been greatly underestimated. The contributions of Bud Powell and Thelonious Monk, both infinitely better known, are closely tied in with the role played by Hope. Some writers and musicians have pointed to the apparent influence of Powell. Certainly they were contemporaries (Elmo was just a year older), close friends, and spent their childhood days together, listening to jazz and Bach and playing for one another. But to compare them as performers is to miss an essential point about Hope. Pianist Hampton Hawes, who knew both Powell and Hope well, makes a perceptive analysis: "Elmo didn't sound like either Bud or Monk to me. I always thought of him as a composer-pianist. Like Duke Ellington, he played his own style, which came out of his writing, and his writing was very good."